Dollar Store Crafts has another wonderful Halloween craft that would be ideal for anyone having a party! We think these are so adorable we almost can't stand it. 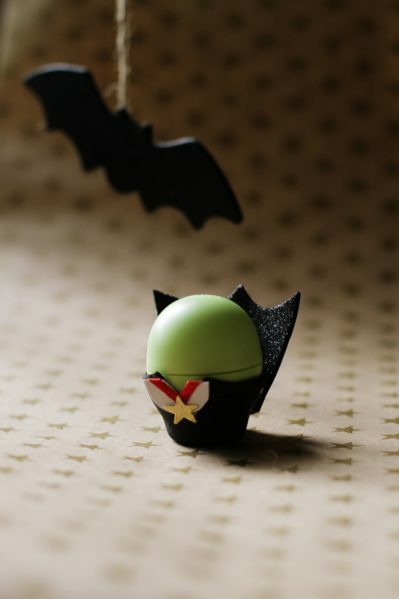 Looking for a cute Halloween trick or treat to give to grown ups in your life? 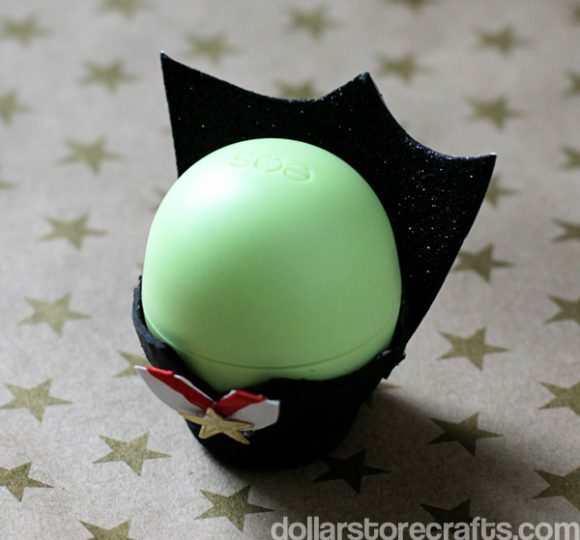 This cute little Dracula is really an egg-shaped EOS lip balm sphere all dressed up for Halloween. What a great "Happy Halloween" for anyone who just doesn't need another bag of candy in her life! I vant to soften your lips! This easy craft is the perfect go-to Halloween gift for teachers, friends, or co-workers. Or use the Count as a cute hostess gift at your Halloween shindig. In my life before Dollar Store Crafts (yes, there WAS a time before DSC! ), I used to make and sell all-natural vegan lip balm. In fact, I was the #3 store on Etsy for awhile! So, I am a very harsh critic of lip balm, and I avoid most brands because they use petroleum-based products. The folks at EOS offered to send me some lip balm, and I agreed once I found out that their product is all-natural. Plus, they're just so darn cute! You can buy the spheres at your local big box or drug store, or on Amazon (EOS Lip Balm ). And, while they cost more than $1, you won't have to buy anything extra to make the cute little Dracula costume, making it a great low-cost grown up Halloween treat. Supplies: If you don't want to use EOS spheres, how about blown eggs or candy-filled plastic Easter eggs? If you choose to use blown eggs, follow the instructions at The Artful Parent: How to Make Blown Eggs. You might have to get really lucky to find plastic Easter eggs this time of year, but maybe you have them in your stash! I left Dracula faceless, but you could add googly eyes and drawn-on fangs! Cut a single cup from an egg carton and trim sides. Paint cup black (inside and out) with acrylic craft paint or spray paint. Allow paint to dry. Cut a small bib out of scrap cardboard (from a cardboard food container or label). If you need a template, trace a nickel, and then cut the circle in half so you have a half-circle. Cut a triangular notch in the half-circle. Glue a “v” of red ribbon on either side of the notch in the half-circle. Glue gold foil star to the red ribbon. For Dracula's collar, cut a 2x2” square of black craft foam or card stock. Cut “swoops” in one side of the square for Dracula's pointed collar. Glue collar to back of black egg cup.